How to Find Hungry Cash Buyers Instantly - Free Content! In the previous article, we discussed how to take phone calls from sellers. We’ll discuss deal valuation, negotiation and contracting process in more depth in a later articles. But let’s say you found a motivated seller, negotiated a great price and put the deal under contract. Now you need to assign the contract to a cash buyer so that they can close on the deal and pay you your assignment fee. The question I get asked all the time is “where do I find these cash buyers?” I get emails from our software clients and subscribers saying “Daniil, I’m having trouble finding any investors to flip deals to”. 1) If you’ve approached your wholesaling business correctly, you’ve already identified the cash buyers first, found out what they’re looking for, and found the right deals that fit their criteria. You don’t need many buyers for this. Just find a few REAL buyers who will buy your deals and then go out and find deals for them. See our Wholesaling 101 article for this. 2) In today’s market (2015, 2016, and likely 2017), there are FAR more hungry cash buyers in almost every single market than there are truly motivated sellers. Fact is, I can say with 100% confidence, that if you put a truly good deal under contract, you should be easily able to find multiple cash buyers for it, no matter where you are. But let’s say you have a deal under contract and now need to quickly find a cash buyer for it. Let’s talk about how to find cash buyers and quickly accomplish this goal. This is an easy one. 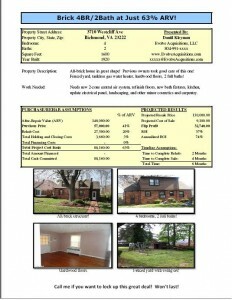 Create an ad (or upload a flyer like this one) to Cragslist under “Real Estate For Sale By Owner” section with your deal. You’ll get calls immediately if it’s truly a good deal. Tip: You can do this even before you ever have a deal. Post a general ad that says you are looking for cash buyers for cheap off-market deals. Or create a “sample deal” and post it on CL. When people call you, tell them that deal is gone, but you’ll have others and would like to add them to your buyers’ list. Ditto. Go to the meetings. Shake hands with people. If you have a deal that you need to sell quickly, print out a marketing report like the one below) and hand it out to people at the meetings. In some markets, in addition to general networking and educational meetings, there are specific “Dealmaker Sessions”. We have them in Richmond here. These are meetings specifically where real estate cash buyers and wholesalers meet. Wholesalers present their deals and sell to buyers at the meeting. These are great if you can find them and offer awesome access to real buyers. 1) Set up your own profile and connect yourself to other real estate players in your market. This network will really grow over time. You can typically connect to people through your existing friends, look up profiles of people you met in local networking meetings, etc. 2) Create a Business Page for your wholesaling business. It’s very easy. Here’s the link on how to do it. Invite friends and contacts to like your page. Don’t overthink about the name. “Cheap Charlotte Investor Deals” or something like that. Your name should communicate immediately the benefit of what you do to your target market. You can post deals to your Business Page, then “boost” the post so that it appears at the top of the newsfeed not only for people that liked your page already, but their friends and contacts, as well as other targeted lists! This an awesome way to reach lots of people that will become buyers! 3) Join real estate investment groups in Facebook. This is a great place to connect with other local and national players. The groups will fall into local groups (for example: Richmond Real Estate Investors) and national groups. There are plenty of other awesome groups you can join but these are the most active ones. Basically same idea as Facebook. Join groups, post your deals there, connect with people. Build relationships. If you post a good deal to a local LinkedIn real estate group, you WILL get calls. Trust me. at the end of the day, people only care about what you can do for them. That’s the truth. So when you message people for the first time, don’t say stuff like “I’d like to connect”. Busy/successful people don’t care about connecting with you. They’re too busy and their network and friend circle is closely guarded, as is their time. Instead, when you message someone for the first time, say: “I have access to cheap, off-market deals in your area. If you’d like to get on my VIP list, let’s connect. Let me know specifically what you’re looking for and I will find it for you”. Boom – now that’s how you start relationships! Real estate auctions are great for meeting actual buyers because you can very easily see who is bidding on what. Get a schedule of your local courthouse steps auctions, as well as any tax sale auctions. Introduce yourself to bidders, tell them you have similar off-market deals you can offer them. Bring business cards. Get theirs also. If you have a deal that you must sell asap and don’t or can’t find your own buyers, then one thing you can definitely do is team up with another local wholesaler who has a bigger buyer’s list and “co-wholesale” the deal with them. Important: Make sure you have the deal under contract before you tell anyone about it. There are many unscrupulous investors out there (unfortunately) that will “go around you” to the seller and try to squeeze you out of your assignment fee. Deal control is crucial here. Especially if you’re going to co-wholesale. The way it works is pretty simple: you bring the deal, the co-wholesaler brings the buyer, and then you split the assignment fee. Or use whatever % split you two agree to. This should give you enough to get started. Implementation is key so put this knowledge to work today!! [SOFTWARE] Free version of Rehab Valuator – every wholesaler must at least have this! Download FREE! [SOFTWARE] Rehab Valuator Premium – if you want to create wholesale marketing flyers and presentations for your deals, this is a MUST! [VIDEO] How to Sell Your Wholesale Deals! under $1,000,000! Need either a partner or lender. Obviously I would want some upgrading money and carrying costs. Email phone number for comments, suggestions or to provide the funds needed. Daniil, you have done it again. I like the part 5 of Wholesaling. Now I have to go back to the other 4 parts. Daniil, I just put up my business Facebook page. Doesn’t have any pictures yet, but almost everything else is there. Thanks for the push! I’m at 2514 Properties LLc. PS – I plan to look at the other 4 parts. Thanks Daniil as always for the info you provide!! But I have a problem when it comes to putting the property under contract with the listing Agent for the properties that come off the MLS my Agent wants to put the contract in my buyers name unless I have proof of funds that I can purchase the property. I And said Agent have closed on one deal already and she knows my buyer will close, but she is limiting the amount of cash I can make on the deal. My buyer is already offering me 1200.00 per property that I find for him and I could make more if I do assignments for some of the properties are much better deals. How do I solve such? This is great information!! With this I am able to expand in different marketing areas to build up my cash buyers list. Great info as always Daniil. Just a want to thank you. Send me all your post and comments i am very interesting, thank you. Very helpful, indeed! Thanks! I made the mistake of not putting the property under contract first as a co-wholesaler before emailing it to my VIP list. I could loose out but it’s my first and it’s a learning curve. Thks again. June S.
Thank you so much Daniil, love your honesty and dedication ! You’re welcome, Carline and thanks for your compliments!